We have a long name: Minnesota Museum of American Art. We’re trying to say it all—that we’re a museum with a great permanent collection all about American art and we’re based in Minnesota, and we care about being in Minnesota. We’re here to inspire you and to exhibit work by really talented local and national artists from the past and the present. There’s a lot jam-packed in that name! When people shorten it, they say “MMAA,” and it sounds like they’re mumbling. They miss an “M” or put in too many As, and well, it’s hard to say. You might accidentally say MMAM, AAM, or—worse—MAMA. All those things refer to something, or someone, else. We here at the Museum—our board, our staff, and friends—decided that it was time to refresh our image, ditch the old acronym, and make it more user friendly, more pronounceable. We’re making great strides with our innovative programming and connecting with new audiences. A recent strategic planning process resulted in a new mission and vision, and we have just launched this new website, so now seemed a great time to roll out a new nickname. Something that you can say. And something that will inspire you to check out what’s going on at this dynamic, new cultural space in downtown St. Paul. So, now you can call us “the M.” It’s the first and most important initial in the old “MMAA” because it stands for Museum and Minnesota, the bedrock of what this organization has been about for more than 75 years. The M is fresh and exciting, a new partner in the cultural vitality of Minnesota’s great capital city, which if you haven’t experienced it lately, is booming with entertainment, restaurants, music, and activity. So next time you have an extra hour or two, hop on down—or take the light rail—to the M, named Minnesota’s “Best Museum” by City Pages this year! 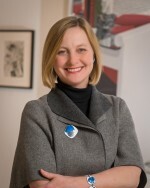 Kristin Makholm took over the helm as Executive Director at the Minnesota Museum of American Art in July 2009. A Milwaukee native, she comes to the museum as a respected curator, art historian, and teacher, having received her B.A. from Northwestern University and her M.A. and Ph.D. from the University of Minnesota. She has worked as a curator of prints and drawings at the St. Louis Art Museum and the Milwaukee Art Museum and was Director of Galleries and Exhibitions at the Minneapolis College of Art and Design from 2004-2009. She won a Minnesota Book Award in 2014 for the M’s exhibition catalogue Modern Spirit: The Art of George Morrison.